A project years in the making is nearing completion and members of IBEW, Local 26 have been a part of it from day one. In 2011, Dominion Energy began construction on a natural gas liquefaction project at its Cove Point LNG Terminal, located in Calvert County, MD. The facility, which has been serving as an import terminal for liquefied natural gas, will become bi-directional and able to both import and export LNG. Local 26 leaders aided its efforts in gaining approvals. After securing the required permits, construction officially got underway in October 2014. The project is on schedule for completion in the fourth quarter of this year. The $4 billion project includes about $58 million allotted for electrical labor. 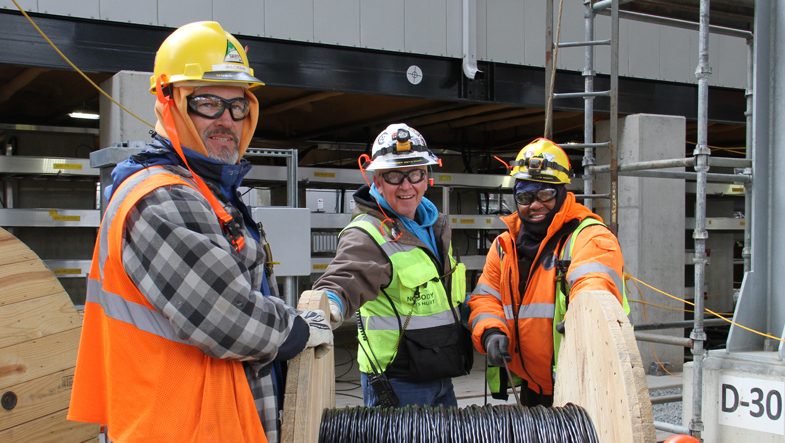 Approximately 450 Local 26 members have worked on the project, installing all electrical work and duct bank; setting equipment; pulling cable; installing trays, terminating MV cable and fiber optic cable; and providing I & C technicians for commissioning activities. They’ve installed an enormous amount of materials on the site: 4.5 million feet of cable, 75,000 feet of cable tray, 380,000 feet of duct bank conduit, 200,000 feet of channel tray and 175,000 cable terminations. The completed facility will export up to 5.25 million metric tons of liquefied natural gas per year. It is expected to generate $40 million annually in tax revenue and bring jobs to Calvert County. IBEW, Local 26 is proud to have played such an important role for the Southern Maryland community.